Your complete XL2 information resource. The Canon XL2 replaces the XL1S, which is now out of production. Outwardly, the XL2 is fairly similar in appearance to the XL1S except for a few significant body styling changes. 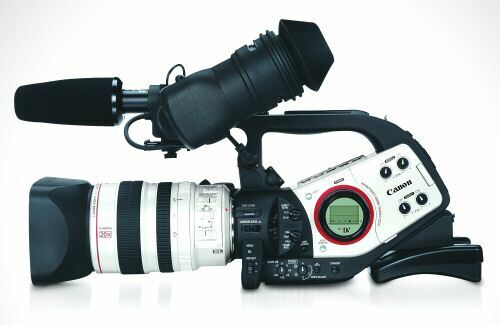 Inside, however, it's an entirely new camcorder with all new circuits, components, image sensors and feature sets. 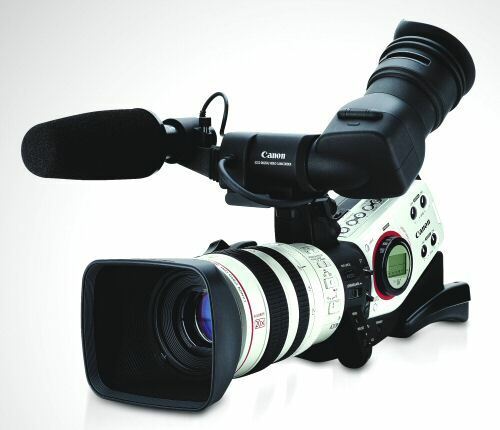 Canon has changed or added many features in order to meet market demand (with first priority given to its existing user base of XL1 and XL1S owners) and to incorporate new digital video technologies. 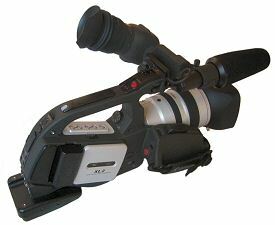 The XL2 may be considered as an entirely new camcorder which retains strong roots to its predecessors, both the original XL1 design of late 1997 and the upgraded XL1S of 2001. In short, the XL2 is a standard definition DV camcorder which records DV-format digital video on an industry standard Mini-DV cassette. It has selectable shooting aspect ratios and frame rates, including native 16:9 widescreen and standard 4:3 ratios; two 24p frame rates; and 30p and 60i frame rates. Its three image sensors are one-third inch true progressive scan CCD's with 460,800 effective pixels per chip (in native 16:9 mode). The XL2 retains the XL lens mount and is compatible with all existing XL lenses. The standard XL2 kit is packaged with a new 20x automatic lens containing Flourite optical elements and Optical Image Stabilization, two Neutral Density filters, focus and zoom presets and selectable focus speeds. There are 16 discrete zoom speeds and a switchable zoom controller built in to the XL2 body grip handle. The standard XL2 kit includes a new multi-function color LCD viewfinder, which may be flipped open for ease of display, or closed to use as an eyecup. The XL2 features two built-in balanced XLR audio inputs with phantom power. An accessory mounting bracket is included with the standard kit. A shoulder pad is built in. A large, professional tripod mounting plate adapter is optionally available. Internally, the XL2 boasts an amazingly comprehensive set of user-definable image adjustments, which Canon has branded as Total Image Control. Customizable "Cine" looks are included, and it's even possible to get down to the CCD level and finitely alter the amount of Red, Green and Blue output. Combinations of a wide variety of adjustments may be saved in the camera as one of three Custom Presets. These settings may be loaded to another XL2 via FireWire transfer, and there are software options (some available now, some will come later) which integrate the XL2 with a portable laptop computer for image recording and other functions. This is not a complete list by any means; it's just a few bullet points covering the most important aspects of the Canon XL2. Native 16:9 CCD Block -- the 1/3rd inch CCD block in the XL2 features true progressive scan and native 16:9. For more info, see the Watchdog article XL2 CCD Block Overview. Selectable Aspect Ratios and Frame Rates -- via external switches, the XL2 can shoot in native 16:9 or standard 4:3 aspect ratios, at frame rates of 60i, 30p and 24p with 2:3 pulldown or 24p with 2:3:3:2 pulldown. Shutter speeds of 1/24th sec. and 1/48th sec. are available in both 24p modes. 20x L IS Automatic Lens -- with Optical Image Stabilization, Flourite elements, two Neutral Density filters, focus and zoom presets and selectable focus speeds. Multi-function Color LCD Viewfinder -- the diopter may be flipped up, exposing the 2" LCD display for easier viewing, or left in place for traditional shooting through the eyecup; the EVF assembly can be shifted along a left-right axis and forward-back axis for the most comfortable shooting position. Balanced XLR Audio -- two built-in jacks may be used for input or output, with or without on-board phantom power; two more XLR jacks may be added via the MA-300 XLR audio adapter. Advanced Accessory Shoe -- allows use of certain Canon accessories such as the VL-3 onboard three-watt eye light or the MA-300 XLR audio adapter. Accessory Mounting Bracket -- removeable; allows the attachment of various shooting accessories such as an onboard hard-disk recorder; wireless mic receiver, dual battery holder and other similar items. Integrated Shoulder Support -- should not interfere with other commercially available third-party shoulder supports. SMPTE Time Code and Tone -- standard SMPTE color bars, choice of two settings for the audio 1kHz tone, choice of time codes as drop frame, non-drop frame, rec run, free run, and user bit settings. Customizable Cine Looks -- variable adjustment of Color Matrix, Gamma, Knee, Vertical Detail, Coring, Black Stretch, Color Gain, Sharpness, Noise Reduction, Film Grain and Hue. Total Image Control -- composed of user-selectable Master RGB, Setup Level, Master Pedestal, Skin Tone Detail, Clear Scan, Zebra Pattern, Intervalometer, AE Shift / Lock, White Balance, Shutter Speeds, Gain and Aperture Control. External Control -- a program mode which allows, among other things, the transfer of user-defined Custom Presets from one XL2 to another. Three Custom Presets -- specific image control configurations may be stored in the XL2's internal memory and recalled at the touch of a button; these settings are transferable from one camera to another over FireWire through the External Control program mode. DV-PC Recorder Software -- a free utility running on Windows XP which allows direct recording from an XL2 to a computer's hard disk via FireWire in MicroSoft AVI Type I or Type II formats. Software Developer's Kit -- has potential for a variety of remote camera menu access and camera control options via FireWire; availability to be determined on a case-by-case basis from Canon USA. I can't speak for Europe or anywhere else in the world, but within the U.S. market, the official word from Canon USA is August 2004 for the XL2 kit, complete with body and lens. The MSRP for the kit is $4999, with "street prices" from some reputable, authorized dealers being perhaps only slightly lower, as initial demand may exceed supply. The contents of the XL2 kit are the same as before; it's a complete package with everything you need; body, EVF, lens, battery, charger, wireless remote, etc. You'll need to supply your own DV cassette. There will be the option to purchase the body kit without the lens for $3999. The new 20x L IS automatic lens which ships with the XL2 kit will be available separately for purchase, and is backward-compatible with the XL1 and XL1S. It will be available in September 2004. The price should be less than $2000. More information about this lens follows below. A new tripod mounting plate adapter, the TA-100, attaches securely to the bottom of the XL2 via four screws and offers a quick-release camera mount. More info about this piece is on its way to the Watchdog. As previously stated, the former XL1S model is now out of production. Unfortunately, there will be no trade-in or upgrade allowance to move from the XL1S to the XL2. Also, it is not possible to have an existing XL1 or XL1S altered or otherwise modified into an XL2. The changes involved go far beyond software and include all internal circuitry and hardware. Besides, the cost of individual replacement of some or all physical components would far exceed the cost of simply buying the new camera. At this point in time, XL1S owners looking to buy into the XL2 are encouraged to either keep their older model and use it for a second camera, or sell it individually on the private market. See Canon USA's published specifications for the XL2. Included in the basic XL2 kit (and available for separate purchase) is the new L IS 20x automatic lens. Outwardly it looks similar to (but is a bit larger than) the previous 16x IS II lens. It is backward-compatible with the older XL1 and XL1S. This lens carries Canon's professional-quality "L" series designation, as it uses flourite elements for superior resolution and color accuracy. It has a six-bladed circular iris. The maximum aperture is f/1.6 at full wide and f/3.5 at full telephoto. This lens also features Canon's Super Range optical image stabilization of the VAP (vari-angle prism) type. There are two built-in Neutral Density filters, a manual/auto focus switch, and a switch to select either a focus range pre-set or a zoom range pre-set. This switch also functions as a Push-AF button. The 20x L IS is an autofocus lens using free-spinning manual focus and zoom rings without stops on an un-marked barrel. This lens, like the 16x IS II before it, is primarily intended for "run and gun" handheld use, but its very long 20x zoom range makes it quite useful for tripod-mounted event videography as well. As the XL2 has just been announced, there are no early user impressions just yet. But stay tuned, for this will change very quickly as the XL2 is seen and handled at trade shows and other events. Of course, the Watchdog will deliver XL2 user reports as they are submitted. As the XL2 becomes available for purchase and begins to penetrate the prosumer DV camcorder marketplace, I intend to follow its usage as I have done for the past six and one-half years for the XL1 and XL1S. As owner's reports and helpful operational articles are submitted, I'll publish them here. Since the original XL1 Watchdog launched along with the first Canon XL1 back in early January 1998, it has accumulated more than 120 pages of content and is the largest online resource of its kind in the world. With your readership and participation, I expect it will only continue to improve and grow as the XL2 is used and written about in the many months to come. Stay tuned! Lots more is on the way. Thrown together by Chris Hurd.